InkjetTips.com – Prep it. Print it. Love it. Hello! I just realized that I posted something incorrectly to my inkjettips.com blog related to metal prints (more on that topic soon!). In advance of another post that’s coming over the weekend, I’d like to share this link to a free three-day Expo Pass at the PhotoPlus Expo in New York City 10/25-10/28, 2017 (trade show is 10/26-28). To access the pass and to sign up for the show, Visit This Page. I hope that you will also visit me at the show in Booth #673. This is a common question, and I have a pretty simple answer. First, it is important to have a calibrated and profiled monitor (a.k.a. display). Without going too far into that topic, the next step I recommend is to use a “target,” or test image, as a benchmark to help determine whether your monitor is displaying images properly. By printing out the target on different days and possibly on different papers, such as gloss, luster and metallic, you’ll be able to compare them side-by-side. You’ll also see whether there are significant changes from day to day. 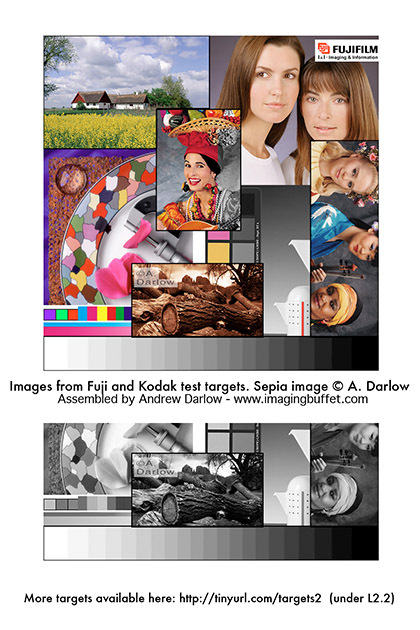 The file contains color and black and white images sized to 280PPI on a 4×6 canvas and saved with the sRGB working space. You should then save the file as a JPG file (quality 9, 10, 11 or 12 is recommended-12 is best, but will create a larger file) and send the target image to your lab to print. Because this tip is primarily for continuous-tone printers like those found in professional photo labs, the file is in the sRGB working space and Photoshop PSD format. Saving a JPG on top of a JPG is a no-no because you will keep introducing more artifacts as you save a JPG on top of a JPG. The image includes some text, which also helps to judge the sharpness of the lab’s output. Note: It is very important to instruct your lab to turn off any color correction, or you won’t be able to properly control the color and density of your prints! I have a similar file here with the same test image in AdobeRGB color space, which is ideal for inkjet printer testing. I posted information on the InkjetTips.com and ImagingBuffet.com workshop pages a few weeks ago about two upcoming full-day workshops that I’m conducting in New Brunswick, NJ at Alfa Art Gallery on Saturday, September 12 and Sunday, September 13. Some seats still remain for both workshops, which are limited to just 8 participants each. I currently have a show on exhibit at the gallery entitled East + West, featuring photographs of New York and Japan. Having the workshop at the gallery allows me to describe the prints up close, and properly lit under gallery spotlights. The fee for either full-day workshop is just $179. I’d also like to offer a $30 discount on either of the two workshops to our readers, which is valid if you register by Thursday, 9/10. For more information or to register for the Saturday 9/12 workshop (the discount code is embedded), visit this page. For more information or to register for the Sunday 9/13 workshop (the discount code is embedded), visit this page. For either day, the page will display “sold out” at the top if all 8 seats have been reserved. I’m happy to announce an upcoming show of my pigment inkjet prints in New Brunswick, NJ from 8/28-9/16/2009. New York City and Japan are places that have had a profound effect on me. In the case of NYC, it started at about age 5, and in the case of Japan, age 18. In this show, I include about 25 images from both places, from 20×24 framed prints to 40×70 inch prints on canvas. At 7pm on August 28, I’ll be showing slides from my trips to North America, Europe and Japan over the last 20 years. Following the presentation, I will have 11×14 prints and large posters available for purchase. I hope to see some InkjetTips.com readers there!